Skydive Lounge offers a three ball challenge for all pool player skill level players. 3 Ball is a great game for all type of players and offers an opportunity to play against some of the best player in riverside, California. 1. A player racks the balls into a triangle of three balls on the rack spot with a tip of the triangle pointed towards the middle of the end of the table. 2. 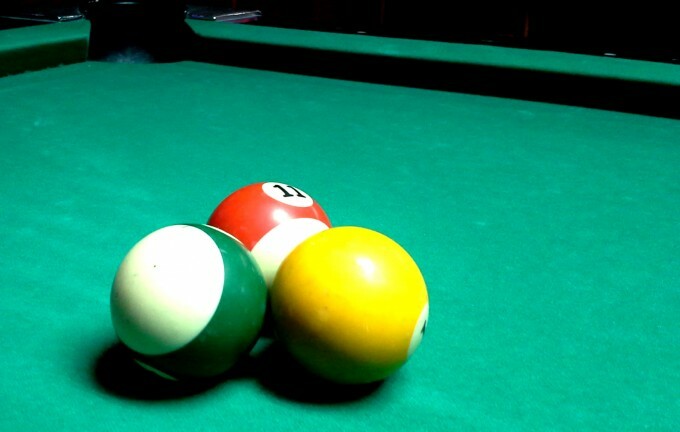 Another player (a player can not rack their own rack of balls) using the cue ball at the other end (the Kitchen) must break the balls, then after the break make the rest of balls in any pocket possible counting the strokes of each shot. Minimum shots will be 1 and Maximum shots are 5. For Example; you break and nothing falls in then you make all 3 of the balls in one by one, the score will be a stroke 4. 1 stroke for the break, and one stroke for every ball put in which is plus 3. Tip: It is to your advantage to make balls in on the break. 3. After the stroke score is recorded and put up on the board then that person who just shot must rack for the next player. Note: if a player does not like the rack given they can ask for a re-rack by another player or league manager. There are penalties for scratch/or jump. If you scratch the cue ball on any shot including the break it will be a 1 stroke penalty. If you shoot the cue ball of the table that is an automatic 2 stroke penalty. 5. After all players have shot an there is no tie then that player will win the players pot. If the score is tied in the end then a roll over is put into effect and all of the players will start over including new pot fees. 6. Player can not newly register in on a rollover, they will need to wait until the roll over is complete and join the next game. If you wish to play in our three ball tournament, just show up at the designated times of Wednesday, Thursday, or Sunday at 3:00pm and ask to be entered into the 3 ball tournament. Come in and go as you please there is no time limit of when you can or can not play.